This is an article written by John Harrison for the Sonning Deanery Branch Newsletter (Spring 2019). “It’s not often you are offered an opportunity to get ringing shown on TV, so you grab it with both hands. One of our ringers has a friend involved in Field Archery. (No, I didn’t know of it either – its a kind of blend between archery and orienteering.) It was featured in the sport slot on BBC Breakfast, and when the presenter heard about ringing he was keen to do a piece on that as well. Some of you may wonder why ringing would appear in the ‘sport’ slot, but it fits very well with the widely used definition of sport as: ‘all forms of physical activity which, through casual or organised participation, aim at expressing or improving physical fitness and mental well-being, forming social relationships or obtaining results in competition at all levels’. Of course, ringing is much more than just a sport–notably as a form of music– which is why it is so special. But the more angles we can get covered to help raise public awareness the better. The presenter, Mike Bushell, is interested in exploring and presenting all forms of sport, and according to Wikipedia (look him up) he holds the world record for trying different sports–over 350 different ones. On Monday 15th March we welcomed Mike and his cameraman Ian to our practice at All Saints Wokingham. They arrived in late afternoon for Mike to get some hands-on training beforehand, but Mike was delayed and Ian arrived early so we re-jigged the plan. Ian got shots of the outside the tower and the splendid view from the roof – in glorious sunshine– and he also took lots of shots inside, including showing the size of the bells. The altered plans meant that instead of the intended two hours of initial tuition, Mike only got about an hour. He was an enthusiastic learner– perhaps a bit too enthusiastic– and made pretty well average progress, ringing both strokes after a fashion by the end of the hour. 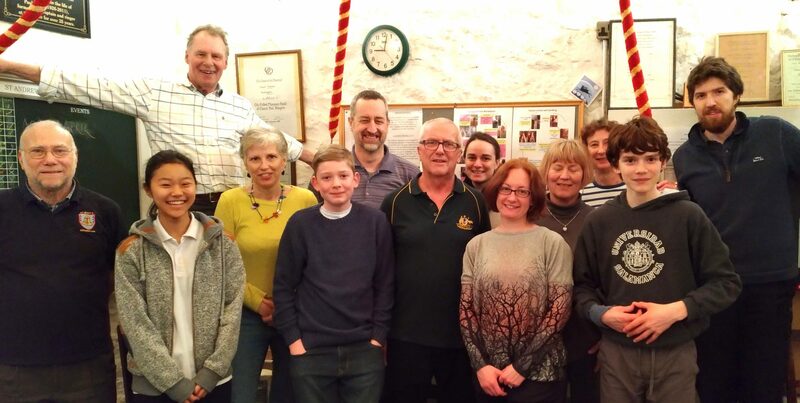 We then adjourned to The Ship (which in the late 1700s used to sponsor ringing competitions) and after a quick meal returned to the tower to join Ian and the other ringers assembling for the practice, at which we had a record turn out of over 20. Mike was filmed being taken through the teaching process and the rest of the time was spent filming typical exercises with the learners and various examples of normal ringing– from all angles: close up, wide shot, looking down from the clock room, viewed from the nave and looking in to the bells themselves. A lot of the time was spent interviewing individual ringers, from our youngest recruits to long standing members, since the focus of Mike’s programmes is to capture not just ‘what’ is done, but why the participants do it and what makes them so keen. A shortened clip of the segment can be found on BBC Breakfast’s Twitter page. Sara Jones and her father Geraint both started ringing in September 2018. Sara, aged 13, has raced ahead of her father and rang her first quarter at St Giles’, Oxford on Sunday 7 April! The 2019 Guild Eight-Bell Striking Competition will be hosted by the North Bucks Branch on Monday 6th May. The Final will be held at Great Brickhill (SMV (8), 14-0-7) MK17 9BE starting at 4.30 pm. If heats are needed, they will be at Calverton and Stoney Stratford at about 1400. The closing date for entries is Sunday 14th April and this date will be strictly applied. Tower Captains/Correspondents will be advised of the time of ringing as soon as possible. The Competition is open to Branch and Tower bands and standard Guild Striking Competition Rules will apply. The Test Piece will be four courses of Grandsire Triples (see attachment). Entries must reach Tony Crabtree (email depmaster@odg.org.uk) by the closing date. The names of the ringers must be given to Tony Crabtree or his deputy before ringing. Pre booked Teas available at Great Brickhill from 5.00 pm. Please give numbers with your entry. Tea, coffee & soft drinks will be available without booking. £1 per tower or Day Tickets available from stewards at first 3 towers on each route. Any Changes will be listed on the Guild website and advertised at the first 3 towers on each route. IMPORTANT the start and finish times shown here will be observed precisely. ODG Young Ringers’ Fest 2019! This is a day’s ringing outing to central Oxford towers. It is arranged specifically for the enjoyment of just young ringers. Any young ringer (under 21) from an ODG tower who can handle a bell safely by himself or herself and can ring rounds will be welcome to join us on the Saturday 13th April. An upcoming ART event – please see the poster below for details. Old North Berks Branch is Highly Commended! Last weekend at the ART conference Award Ceremony, we heard that ten applications had been made for the Award for Excellence in Recruitment or Retention (of learners). The Old North Berks Branch of the ODG was runner up and received a Highly Commended Certificate for the work done by the Branch Ringing School. Winter seems almost to be over; the birds are beginning to shout at one another in the mornings and very soon ringers will be able to get to practice nights in daylight, what a joy that will be rather than negotiating a dark and sometimes treacherous route to the ringers’ door! It is the season for Branch AGMs and the officers and stewards have tried to attend as many as possible; the ones that I didn’t manage to get to this year will be top of my list in 2020. It has been a real pleasure to catch up with many people at the Branch meetings, I have enjoyed finding out about topics of importance and made the most of delicious teas; thank you all for making me feel welcome. We are fast heading for the busy summer ringing schedule with weddings and other special occasions which call for our skills. For some new bands this will be a new, and perhaps, daunting experience but I am sure that you will be well supported by neighbouring towers with more experienced ringers. The Guild AGM will be held at Great Missenden on 18th May. Please try to attend, we need everyone’s enthusiasm and support, and all ringers are welcome. Between now and then I will be moving home – for a few years I considered Orkney but there are too few bells up there to keep me busy – so I am only going a few yards down the road in Wheatley. It is highly likely that BT will cut off my contact with the ODG (and the rest of the world) for one to two weeks while they decide who is going to connect the wire, or flick the switch, or whatever manoeuvre it requires, so if you email me and I do not reply you will realise that I am in the throes of unpacking boxes grumbling at the engineers. Welcome to the new website for the Oxford Diocesan Guild of Church Bellringers. We are currently in the process of developing this new site in an agile manner, so please bear with us while we get everything up and running. This does mean that not all aspects are final, and the site shall grow over time. For now, you’ll find all the basics here, such as officer details, links to our branches, and most importantly a diary of upcoming Guild events. You will find that layout and styling may change over the next few weeks. Should you have any queries, please do get in touch with the Web Master.